The Diocese is led by the Bishop, The Rt. Rev. Dr Jacob Chimeledya who was installed as the second Diocesan Bishop on Sunday 30th September 2007 and, by the grace of God, was elected as the Archbishop of Tanzania and enthroned on 18th May 2013. Under him is the Diocesan Secretariat which comprises four officers heading the departments of Development Services, Social Services, Stewardship, and Mission & Evangelism. Also there are three church organizations namely, Children Ministry (HUWA), Youth Organization (TAYO) and Mothers’ Union (MU). There are 140 clergy working in 115 parishes with around 530 congregations. It is estimated that there are about 200,000 parishioners. To Spread the Kingdom of God in the Diocese through Evangelism and Christian Education. To build up and equip the Body of Christ for service (Discipleship). To promote holistic development of the population through education and other social-economic services. To promote partnership and co-operative action in mission with other churches and organizations dealing with the Spiritual and physical development of the human being, both within the Diocese and beyond. 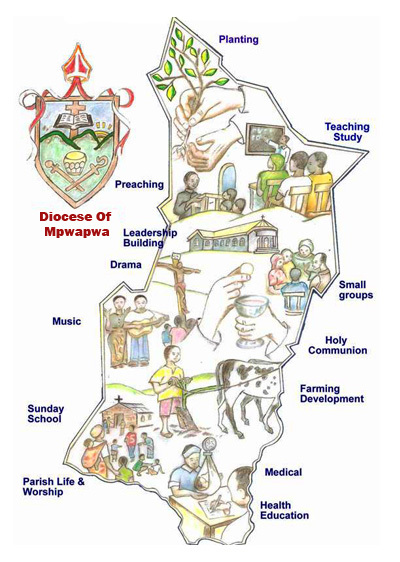 The Diocese takes in the administrative boundaries of the Mpwapwa and Kongwa Districts (approximately 4144 square kilometres (1600 square miles) in area), which were created before the First World War by the German Colonial Authorities. It is almost centrally located on the Tanzanian mainland, lying between the 5º 30′ and 7º latitudes and straddles the 36º longitude line. Its dominant physical features include semi-arid scrubland formed at around 3000ft ~ 4000ft above sea level, and a mountainous belt across the centre with peaks upwards of 7000ft. Climatically Mpwapwa is relatively cool at night and warm and sunny during the day. The average temperature is 21ºC with average rainfall of 700mm per annum. In good years the rainy season starts from mid-November until the end of April, but about one in every five years it is prone to fail completely. Mountains and highlands get 750-1000mm of rains per year and the dry plateau areas receives 450-750mm per year, while the remaining area (over 90%) of the land receives 350mm of rains per year. Light forests are found on the mountains and plateau areas; the rest of the area is semi-arid with few dotted or scattered trees, characterized by uncertain and sometime erratic rainfall. Most of the people are peasant farmers and pastoralists. The primary crops include Maize (north), Sorghum and Millet (south) as Staples, and Nuts, as cash crops. Most cultivation is by hand hoe, although the use of animal and mechanised tilling is growing. Mpwapwa farmers operate in a relatively free market for Commodities they produce but most is consumed within the household. Agriculture and Livestock breeding generate 90% of family incomes. Underemployment, other than working on the land, is extensive.